On Saturday Night the Hard Rock Hotel in Las Vegas, Nevada will host a two world title fights to be televised on HBO. Golden Boy Promotions is the lead promoter for this card which will feature a WBO Junior Middleweight Title Fight between Jaime Munguia and Liam Smith. The co-feature of the night will be between Alberto Macahdo and Rafael Mensah for the WBA Regular Junior Lightweight Title. Munguia has gained some prominence with his resounding victory over Sadam Ali to capture his first world title and was mentioned as a possible replacement opponent for Gennady Golovkin when the rematch between him and Canelo had to be rescheduled. The following is a preview of both world title fights. Alberto Machado is a champion who just won his title with a mild upset over Jezreel Corrales by knockout in his last fight. He’s 27 years old and has a very large reach of 72” for his weight class. His opponent, Rafael Mensah, fights out of Ghana and not much is known about him except for his record. He’s never fought outside of Ghana but is the number one contender for the WBA Title. Macahdo has been very active recently and fought three times in 2017 and four times in 2016. Mensah has also been active and fought three times in 2017 and twice in 2016, but his last two opponents that he beat had losing records. Win two fights against below .500 opponents gets you a title shot in the WBA. Machado had moderate success as an amateur and was a National Champion at the Junior Olympics. Mensah has no notable amateur accomplishments. Machado has defeated the likes of Carlos Morales, Jezreel Corrales, Juan Jose Martinez, and Miguel Mendoza. Mensah has defeated nobody of note, but opponents with good records that he has defeated include Fatiou Fassinou and Abdul Jabir. Machado probably could probably take the unproven Mensah lightly and still be a heavy favorite. Liam Smith was originally scheduled to face Sadam Ali for the WBO Junior Middleweight Title, but had to pull out and was replaced by Jaime Munguia, who won the title with a dominating TKO victory. On Saturday they will face each other for that WBO Title. Munguia has twenty five stoppage wins on his record and will have about a two and a half inch height advantage over Smith. Smith has fourteen stoppage wins on his record. However, Munguia has six stoppage wins in a row. He is also only twenty one years old and eight years younger than Smith. Munguia has defeated the likes of Sadam Ali, Johnny Navarrete, Uriel Gonzalez, and Juan Macias Montiel. He has fought three times in 2018 already and fought seven times in 2017!! Munguia was a national gold medalist as an amateur and turned pro at the age of 16. Smith fought three times in 2017 and his lone loss was to Saul Alvarez. He has defeated the likes of Liam Williams, Predgrag Radosevic, Jimmy Kelly, and John Thompson. He was an English ABA National Champion as an amateur. Smith’s stoppage loss to Canelo should be concerning for his fans, as Munguia is also known for being a strong puncher. Munguia activity as a boxer is rare in today’s age and that should be helpful for him on Saturday. 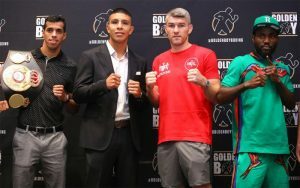 The hype of Munguia has slowly been gaining steam, and this writer expects it to pick up more steam with a resounding win on Saturday.